I know it may surprise many but color blindness is not a form of blindness. It is a deficiency in the way you see color. Those with this vision problem have difficulty distinguishing certain colors, such as red and green or blue and yellow. Color blindness is an inherited condition. It a affects males more frequently than females. Research from Prevent Blindness America, indicate that approximately eight percent of males and less than one percent of females have a color deficiency. The effects of color vision deficiency ranges from mild to severe depending upon the defect. 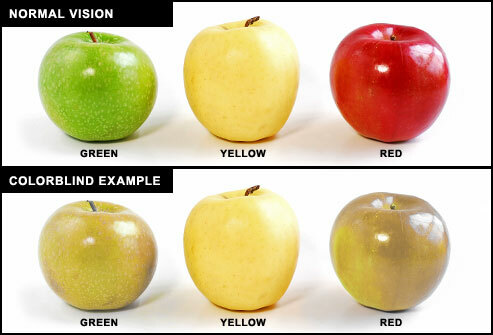 If you have inherited color blindness your condition will stay the same throughout your life. It will not get better or worse. The retina has two types of light-sensitive cells called rods and cones. These are used to process images. Rods work in low light conditions to help night vision, but cones work in daylight and are responsible for color discrimination. The three types of cone cells each have a different sensitivity to light wavelengths. One type of cone perceives blue light, another perceives green and the last perceives red. How do they work? When you look at an object, light enters your eye and stimulates the cone cells. Your brain interprets the signals from the cones cells so that you can see the color of the object or item that you are looking at. The red, green and blue cones all work together so that you can see a spectrum of colors. When the red and blue cones are simulated in a certain way you will see the color purple. The most common form of color blindness is the red-green color deficiency. It is much more rare to inherit the trait that reduces the ability to see blue and yellow hues and this condition affects men and women equally. Most who are considered color blind can see colors, but certain colors appear washed out and are often confused with other colors, depending on the type of color vision deficiency they have. The term color blindness is very misleading, because most with this condition see color, but their color perception is often limited and inaccurate. Contrary to popular belief, it is rare for a color blind person to see only in shades of gray. People are born color blind so if you develop color vision problems when you have always been able to see a full range of color you should call your doctor and make an appointment. Any type of color loss whether sudden or gradual can be a symptom of a multitude of underlying problems that need to be evaluated including cataracts. Previous post: What is low vision? Next post: What is Albinism?